Raleigh has THE MOST live music in North Carolina. The most dates, the most venues, the most bands, the most genres--the most any music maniac could hope to find. You can find a show here every day of the year and from one end of the county to the other. Big bands, small bands, slow bands, fast bands, hard rock and soft ballads. Large-scale arenas, mid-sized concert halls, mom-and-pop playhouses and only-the-locals-know-about-dives. All. Found. Here. 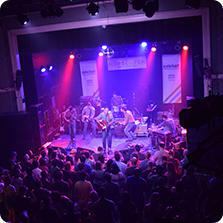 Celebrate Raleigh&apos;s stellar music scene and themostnc.com, the Raleigh area&apos;s new, comprehensive live music calendar with virtually every date in Raleigh as soon as it&apos;s announced. Grab a pair of themostnc.com sunglasses* at select locations and events in Raleigh in May and June 2015. Take a photo of yourself wearing the glasses. Post it on Instagram, including the hashtag #themostnc. Look out for a prize-winning notification (a comment from visitRaleigh on your selfie photo on Instagram) on June 26, 2015, to see if you won! Good luck and happy rocking! Read the official rules. Entry for the contest closes at 11:59pm on Thurs., June 25, 2015. VOID WHERE PROHIBITED BY LAW.